FZ-10 Now Available: Penske Shocks! 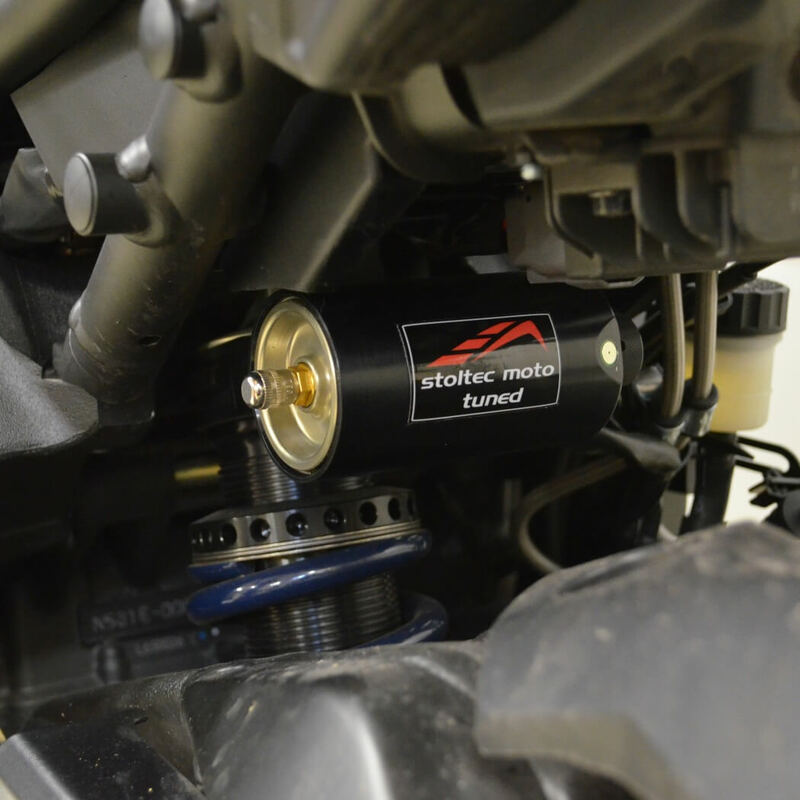 After nearly 5 months of development - YES, FIVE MONTHS - we're excited to finally offer the Stoltec Moto -spec Penske shock lineup!! We've been through the ringer on this one. Despite sharing the same dimensions as the R1, the R1 approach did not work as well on the FZ-10. As such, it was a long road to get to this point. After all the time spent on the shock dyno and running the calculations, we left no stone unturned. We've tried multiple spring rates, pre-load settings, piston designs, and shim stacks. We arrived at something that improved the -10's road manners while still keeping the DNA of the YZF-R1. Here at Stoltec Moto, we don't sell products we don't believe in and stand behind. This is no different. It took 5 months of work because we wanted to get it right. Available in two models: the 8983 Double Clicker and the 8987 Triple Clicker. Same as 8983 Double Clicker, but adds high speed compression damping. As an introductory special, we're going to run a deal for forum members. Email us for spring rate selection and pricing information. As a bonus, both Penske and Stoltec Moto will be throwing in some free swag, so be sure to include your shirt size and forum name. This promotion ends on 01/31/2017. Spring is right around the corner. Take advantage of the downtime to get the bike dialed in before spring. Besides, you'll need something to do while you're drinking beer in your cold garage. Thank you for this upgrade. [*]Same as 8983 Double Clicker, but adds high speed compression damping. Great news and I, for one, am very excited. I'd love to get in on the promotion, but spring is a long way off for me. A second promotion for colder climate riders in April would be greatly appreciated. It would be a major plus to do back to back rides before and after the swapout. And, for us Norderners, reading reviews from our warmer climate colleagues should get all us pumped up before placing our orders. Sorry Jim...you'll never see another deal like this from us. I guess this shock and the fork springs will make a big difference in the way the bike rides? I don't do track days, just street riding. My biggest complaint is the bumps just jolt the bike, even the small bumps. Is it going to help smooth the bumps? That was the primary aim all along. Ride quality on the road was just subpar from the factory. Thanks Nick. I got your email and will get you that info tomorrow. Sounds good. Will be ready when you are. My order is in house. I was bad....got it all. Nothing 'cheap' about the 8983! I love the adjustability of the 8987, but the 8983 does a wonderful job balancing high/low speed compression right out of the box. In fact, I use an 8983 on my personal Honda VFR800. Joking. Just meant I was a cheapskate, because I passed on the entire front/rear package. I'm confident that the 8983 will take my FZ-10 to the level it's been lacking. Being able to adjust independently for everything and not be bottoming out on the majority of the more serious bumps should be a huge improvement over the standard shock. The early adopters special discount was too good to pass up for triple and front. If they was a brake line 'with it' discount I'd have jumped on that too. If you're going to do this mod, no better time than now to do it. Well, I speak on behalf of both Stoltec Moto and Penske when I say I hope you guys are pleased. We spent a long time trying balance the -10's inner sport bike with something road-worthy. Feel vs. comfort. Responsiveness vs. composure. At this point, it's a pretty good balance from where I sit. Wishing it was warmer here...cold air and roads don't do the comfort factor any favors. Can't wait for that first 60-80 degree day to enjoy the work. Few days left on this offer! Not yet, but should be soon!